Looking for a way to make a difference in your community? We think volunteering should feel good and be fun! Looking for Volunteers to help change the world, for our Seniors, one meal at a time! 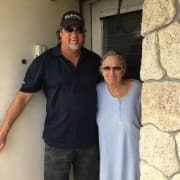 Deliver meals throughout Century Village in West Palm Beach, FL. We are "More than a meal", providing a hug, smile, laugh when needed and being the eyes and ears for family members. Come volunteer with us and see how just 2 hours a week can change the lives for seniors in Palm Beach County. We currently serve from Hypoluxo Road north to Jupiter, but are specifically looking for volunteers in Century Village, West Palm Beach. Can't commit to one day a week due to your schedule? Why not be a substitute volunteer - we need subs every day! Please call us if you'd like to check us out, please contact Stefanie to arrange to attend one of our upcoming orientations.